New User At Faasos And Looking For Some Exclusive Discount On Your First Order? Now order anything online and get Flat Rs 150 OFF on all food orders. Minimum order value - Rs 350. Faasos Happy New Year Offer on All Food Orders. 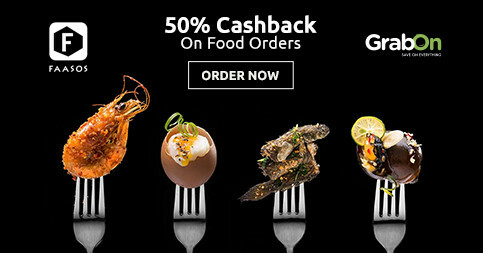 Get 100% Paypal Cashback Up To Rs 200 OFF on food. Cashback will be credited within 24 hours of delivering your order. Order Food from Faasos and up to Rs 100 Caashback. Pay Through PhonePe Wallet and get 30% Cashback. 10% Cashback For New User & 10% Cashback Up To Rs 100 For Old User. Apply the given Faasos Offer Code to get the promised Deal. Follow the landing and order now. Hurry! Maximum cashback up to Rs 100 per valid order. Faasos giving flat 50% cashback on payments via PhonePe wallet (UPI, Cards). Cashback is substantial on two exchanges (per client). Material in all urban communities. This promotion isn't substantial for combos, MRP things, refreshments and Cannot be joined with some other offers. Cashback can be utilized for revives, charge installments and installments on PhonePe accomplice stages/stores. Get Flat 10% OFF on your orders + 20% extra cashback on payment made by Amazon Pay. Order from the supreme collections of LunchBox, Signature Wraps, Royal Rice Feasts & more. Apply the coupon code while making payment in order to avail the offer. Coupon/Offer Details: Verified on 23 Apr 2019. Faasos, Online Food Delivery web store brings you the scrummy range of breakfast, rice feast, snacks, wraps and dinner catalog from classic faasos collection and grab 50% discount on first transaction. Apply the given code at checkout. It is valid for min. Rs 350 orders and this cannot be combined with other offers and not applicable on combos/beverages. Order Now!! Order Now and Grab Flat 20% cashback @ Faasos on ordering minimum Rs 300 using the given discount code at payment page. Applicable only on transactions from the classic Faasos collection. This offer cannot be combined with other coupons and not applicable to combos/beverages. Enjoy upto Rs 100 refund on all orders. Get flat Rs 200 off on your first order. Coupon/Offer Details: Wonderful Wednesday Offer is here: Faasos is bringing home the finger-licking Wraps and Chai at best prices i.e. along with Flat 20% Cashback on minimum Rs 100 order using the given offer code. Valid Only for the New faasos app and desktop users and can be redeemed only once. Offer cannot be clubbed with any other deal. Not valid on combos & beverages orders. Minimum cart amount should be Rs 200 in order to get delivered at your doorstep. Valid only when transacting through debit/credit cards. Also, Get up to 30% cashback on wraps and rice combo deals in "Value Combos" section. Valid in major cities like Bangalore, Hyderabad, Chennai, Delhi, Mumbai, Ahmedabad, Indore, Noida, Gurgaon, Pune and more. Order Now! Coupon/Offer Details: Wednesday Offer - Grab 20% cashback offer on classic food section assortment containing jumbo wraps, dal makhani, smoked butter chicken etc. Not valid on wraps and rice feasts. This code cannot be combined with other vouchers and can be redeemed only once. Min. order amount should be Rs 250. Maximum Cashback Rs 200. Not applicable to MRP products, Value Combos & Beverages. Valid only in Classic Faasos orders. Apply the given deal code at payment page. All your will vanish in the air just by looking at Faasos menu. Well, that’s how mouth-watering and unique it is. Faasos is a food ordering service platform but with a twist. It gives rolls, wraps, rice combos and more to its users but it is not like any other rolls-wraps place. Faasos offers and services are mainly app-based. One look at Faasos food spread and you will not be able to pick just one dish. It gives you the best home-made and tasty food with fast delivery. From wraps to rolls, from rice combos to kinds of pasta, from chai to vada pav, from chocolate fantasy to Rasgulla, from biryanis to ice creams - you will find everything on this app. And if you are lucky, you might end-up with Faasos buy 1 get 1 offer as well. Faasos understand the value for money that every customer tries to find in everything they buy. That is the main reason why it keeps them happy with offers such as Faasos first order discount [exclusive for its first-time users]. It provides an exclusive Faasos coupon code to its special users. It offers special Faasos Monday offer to all its users where you will get more than 50% discount on your orders. You can also try Faasos app offer or coupon to get attractive discounts on the app. So if these offers by Faasos are not exciting enough for you then you can always visit GrabOn. This site will also give you exclusive Faasos coupons and the best attraction is that this discount is an extra discount. How to get exclusive discounts, buy 1 get 1 offers using faasos coupon codes? Go to GrabOn.in type in Faasos in the search bar and press enter. Copy and Apply the code at Faasos mobile app/website. Select your choice of biryani, wraps, rice feast, gravies etc, apply the discount code at checkout page while placing the order. Faasos is popular not only among the foodies but also among the ones that love to treat people. If you want to entertain your guests that have just taken you by surprise and dropped in just to say hi! You can instantly order your favorite food online and have the food delivered at your doorstep before you perhaps finish arranging the cutlery on the table. Whether you want to try out your favorite biryani or meal combos, dessert, you will have all this on your platter within no time. And you can make this experience even more enjoyable and fulfilling by availing the coupons that they offer to their customers. Aside from the coupons, you also get to enjoy cash back incentives and flat cost cuts on orders above a particular amount. Keep a close watch as these deals keep changing and every new deal brings with it some amount of thrill and pleasure.